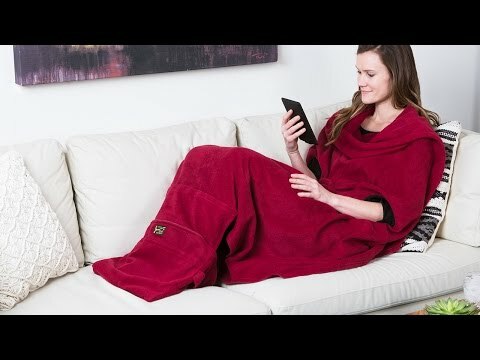 Snuggle up to this wearable travel blanket. It has cuffed arm holes, pockets, and a detachable foot warmer. Plus, it folds up into an easy-to-carry pillow that straps to a luggage handle. Whether you’re flying, road-tripping, or looking to stay warm at home, this blanket is easy to cozy up to. Dimensions: Folded: 12” x 14” x 3”; Open: 56" x 60"
I don't travel without it!! I have taken this on several flights and I absolutely love it!! I also just took it on a 6,000 mile coast to coast road trip. I am often cold. On our road trip I had to visit a dentist and I even took it in there and was so happy since most doctors offices are cold. I purchased on of these for myself and I loved it so much, I purchased one for my sister as well! The clever design of the pouch makes it simplees it simple to include with your carry on. Get head-to-toe comfort. This soft, fleecy, Made in the USA travel blanket keeps your whole body cozy. Unlike other “wearable” blankets, this is one is multifunctional. Cuffed armholes give you extra mobility to read, eat, or type. The detachable foot warmer keeps your toes toasty, too. . . and various pockets keep personal items right nearby. Smart Blanket is designed to travel well. The lightweight fabric folds into an easy-to-carry pillow that straps to your luggage handle. In fact, Maker and fashion designer, Yon O Chang came up with the idea during an uncomfortable plane ride. It’s easy to warm up to this cozy companion whether you’re flying, driving, or at home on the couch.